Comes equipped with: Rear Air Conditioning, Sunroof, Bluetooth, Navigation System, Front Heated Seats. This Audi S7 also includes Power Driver's Seat, Clock, Climate Control, Power Passenger Seat, Tachometer, Dual Zone Climate Control, Cruise Control, Homelink System, Power Steering, Telescoping Steering Wheel, Steering Radio Controls, Wood Trim, Power Mirrors, Moonroof, Lthr. Steering Wheel, Driver Airbag, Fog Lights, Passenger Airbag, Intermittent Wipers, Side Airbags, Rear Defogger, Security System, AM/FM, Anti-Theft, CD Player, Subwoofer, Satellite Radio, Rear Spoiler, Sport Seats, Center Arm Rest, Remote Trunk Lid, Vanity Mirrors, Heated Mirrors, Rear Fog Lamps, Child Proof Door Locks, Daytime Running Lights, Parking Sensors, Reverse Camera, Side Curtain Airbags, Roll Stability Control, Adaptive headlights, Power Lift Gate, Tire Pressure Monitor, Carpeted Floor Mats, Overhead Console, Aux. Audio Input, HID Headlamps, HD Radio, Onboard Hard Drive. 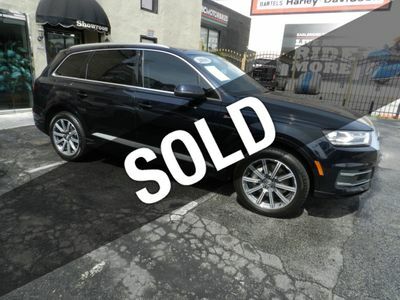 With its Buyback Qualified CARFAX report, you can rest easy with this Audi purchase. Comes equipped with: Black Optic Package, Carbon Atlas Inlays, Driver Assistance Package, Led Headlights, Phantom Black Pearl Effect. This Audi S7 also includes Power Driver's Seat, Clock, Climate Control, Power Passenger Seat, Tachometer, Dual Zone Climate Control, Cruise Control, Homelink System, Power Steering, Telescoping Steering Wheel, Rear Air Conditioning, Steering Radio Controls, Wood Trim, Sunroof, Power Mirrors, Moonroof, Lthr. Steering Wheel, Driver Airbag, Fog Lights, Passenger Airbag, Intermittent Wipers, Side Airbags, Rear Defogger, Security System, AM/FM, Anti-Theft, CD Player, Subwoofer, Satellite Radio, Bluetooth, Navigation System, Rear Spoiler, Sport Seats, Center Arm Rest, Remote Trunk Lid, Vanity Mirrors, Heated Mirrors, Rear Fog Lamps, Child Proof Door Locks, Daytime Running Lights, Parking Sensors, Reverse Camera, Side Curtain Airbags, Roll Stability Control, Adaptive headlights, Power Lift Gate, Tire Pressure Monitor, Carpeted Floor Mats, Overhead Console, Aux. Audio Input, HID Headlamps, Front Heated Seats, HD Radio, Onboard Hard Drive.